The halls of McCormick Place were bustling as usual at RSNA 2016. With a multitude of things to see, sessions to attend, and people to talk with at the show, it's not easy picking just five trends that bear watching in the coming year, but here's Radiology Today's crack at it. 1: Artificial intelligence. AI, which generally refers to a type of machine learning called deep learning, was the hottest topic this year, and second place wasn't close. It seems as though everyone wants in on AI like Danny DeVito in a Nespresso commercial but, as Eliot L. Siegel, MD, FSIIM, FACR, said in one of his talks, "Deep learning is still a black box." Siegel's comment was part of an interesting point/counterpoint discussion with Bradley J. Erickson, MD, PhD, about the potential for AI to usurp human radiologists within the next 20 years; Erickson took a less skeptical view of humans' ability to develop deep learning. The lively back and forth touched on many of the points that are likely to be debated as AI-flavored products make their way toward the market. Although much will be said and written about just when AI will put radiologists out of work, the consensus seems to be, as Siegel put it, "The answer is not computers replacing radiologists but working hand-in-hand with radiologists." In that vein, several companies, such as ContextVision, Enlitic, IBM/Merge (Watson), vRad, and Zebra, to name a few, are focusing on deep learning-enhanced algorithms that help to identify specific conditions, such as lung or breast nodules. Although there are myriad tasks that machines don't perform well, the accuracy rates for these algorithms are rapidly approaching—and in some cases, exceeding—human capabilities. On the other end of the spectrum, DeepRadiology promises a fully autonomous—read: no radiologist necessary—system for interpreting medical images. It's FDA-pending, of course. Maximizing time was a common theme among the AI people I spoke with. Image volumes are increasing with no end in sight, and AI algorithms that help radiologists separate normal findings from clinically urgent or important ones seem like a useful place to start. AI is also finding its way into clinical workflow. In another example of maximizing time, Agfa is using the Watson platform to more efficiently incorporate patient info from the EHR with medical images, in an effort to provide radiologists with a more comprehensive picture of a patient's overall condition. 2: Enterprise imaging. Earlier this year, RSNA partnered with the Sequoia Project to launch the RSNA Image Share Validation Program. The joint venture was prominently featured at the show. The goal of the program is to test vendor systems for compliance to quality standards that have been deemed most effective for accurate and efficient image exchange. The first seven vendors to complete the program are Agfa Healthcare, Ambra Health, GE Healthcare, Lexmark Healthcare, LifeIMAGE Inc, Mach7 Technologies, and Novarad. The program, which is open to vendors of imaging systems such as RIS, PACS, and reporting systems, encourages vendors and radiology sites to adopt image-sharing capabilities that expand access to medical images and reports wherever they are needed. While everyone pretty much agrees that interoperability is necessary, agreeing on standards has been a slow process; there are still data siloes throughout health care. Additionally, images from other departments, such as wound care and dermatology, are becoming part of the patient record and bringing a new meaning to the term "enterprise imaging." Along with that trend, consumers are coming to expect access to their medical images and reports, and doing that efficiently will require still more data exchange. As collaborative health care becomes more of a business imperative, consumers demand more access to their medical data, and image volumes expand exponentially, digital image sharing will become an essential part of imaging IT. 3: MACRA. Most people—and nearly all taxpayers—would agree that getting the most for your money is desirable. That's been a big knock on our health care system for years: We pay more than anybody else, but our outcomes aren't especially impressive. Tying income to outcomes sounds great, but to make it work you need a mechanism that accurately measures how specific interventions affect patient care. This is particularly difficult with medical imaging, which is frequently a frontline treatment that, in many cases, reduces downstream costs—a difficult number to quantify. The Centers for Medicare & Medicaid Services' latest attempt to measure radiology's contribution to health care outcomes is the Medicare Access and CHIP Reauthorization Act of 2015 (MACRA). As we noted in July and December 2016, radiologists will be incentivized to more efficiently connect with patients, referrers, and health care communities. These types of activities also speak to what many in the radiology community have been saying for a while about radiology's role in health care: Radiology needs to evolve if it wants to continue to thrive. Judging by the MACRA discussions at RSNA, a lot of people are still trying to figure out how to do that. One thing is certain, though. If that evolution is tied to reimbursement, people will keep trying. 4: 3D printing. Fascination with 3D printing continues to grow. The "3D Printing in Medicine" exhibit at RSNA was a popular destination, and there were around 40 sessions dedicated in some way to the topic, from hands-on sessions to poster discussions and everything in between. RSNA 2016 heralded the introduction of a special interest group, chaired by Frank J. Rybicki, MD, PhD, to focus on maintaining radiology's prominent place in the 3D printing specialty. Considering that medical images are one of the pillars of the technology, that's no surprise. Whether physicians want 3D models to use for simulations, cutting guides, treatment planning, or even surgical implants, 3D printing is proving to be a versatile medium. Although there are quite a few technical considerations involved with producing an accurate 3D model, the technology is advancing. Back in 2015, the 3MF Consortium was launched with the aim of defining a 3D printing format that allows design applications to be used with a variety of applications, platforms, services, and printers. At RSNA 2016, 3MF member Materialise announced partnerships with Carestream and Siemens Healthineers on a service called AnatomyPrint, which delivers 3D models to its customers. Carestream will use AnatomyPrint to create models for its customers, and Siemens featured Materialise's Mimics technology at its RSNA booth. 5: The consumerization of health care will affect radiology. As Robert M. Wachter, MD, pointed out in his keynote speech, clinical IT and consumer health records don't connect yet, but when they do, it will have a big impact. At some point, probably sooner rather than later, consumer culture, driven by the convenience of smartphones and other mobile devices, will become part of health care in the same way that it's become part of the retail and banking industries. Social media has also become a driving force in consumer culture. Although not as prevalent as the 3D printing sessions, several sessions at RSNA offered strategies to help radiologists engage with patients on social media. 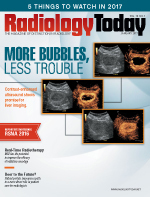 Many radiology professionals believe that the specialty would do well to stay in front of this trend. In fact, many believe that radiologists need to become more engaged in health care delivery overall if they want to stave off commoditization. Emphasizing this point, the RSNA president's address by Richard L. Baron, MD, FACR, was dubbed "Beyond Imaging: Ensuring Radiology Impact in Clinical Care and Research." Baron's main points were that radiology will need to deliver value in the face of changing reimbursement models, work collaboratively as part of a health care team, continue to innovate, and focus on patients rather than focusing on just images. Whether that means assisting in the implementation of patient portals; being "the doctor's doctor," as they were once known; or being available to answer patient questions, including on social media, it certainly means thinking outside the reading room.